Ireland, with its long history of emigration, can play a leading role in international migration issues, said Patrick Byrne, senior Europol representative in the U.S. Europe is being overwhelmed with refugees from the Middle East, North Africa and Asia; and the issue also is roiling the U.S. presidential election. Patrick Byrne, senior Europol representative in the U.S., and RTE’s Washington correspondent Caitriona Perry. In 2012, Byrne became the first Irish person appointed to the Europol post with the European delegation in the U.S. His job is to help increase strategic and operational cooperation between the E.U. and U.S. federal, state and local law enforcement agencies on issues such as terrorism, cyber crime, organised crime and drug trafficking. 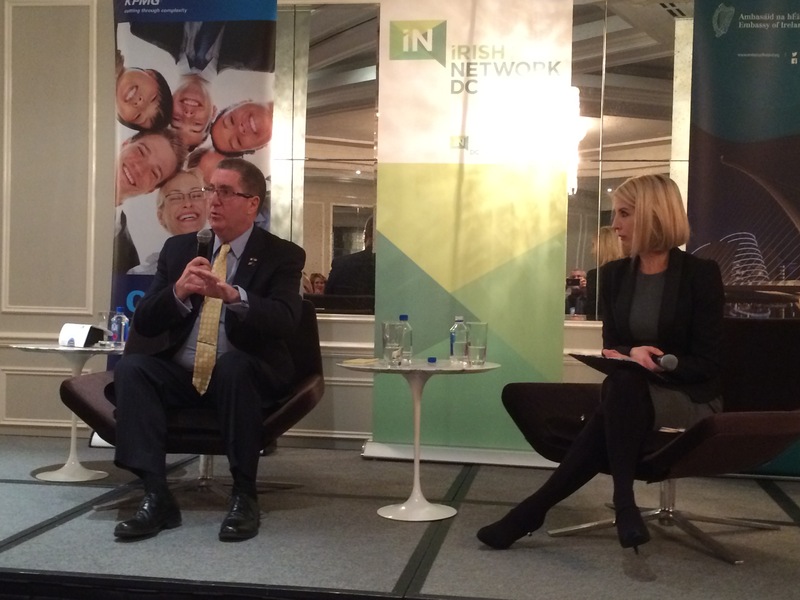 Interviewed by RTÉ Washington correspondent Caitriona Perry, Byrne said information sharing between the E.U. and U.S. has increased 63 percent in recent years. In 2013, he wrote about “Increased Globalization of Organized Crime and Terrorism: Europol and the EU Perspective” for The Police Chief magazine. Byrne said that Ireland’s top contributions to international law enforcement have come in the areas of peacekeeping, with more than 56,000 missions around the world; conflict resolution, including Northern Ireland; and financial crime. Twenty years ago, he helped establish the Criminal Assets Bureau at An Garda Síochána. I asked the career cop if he has looked at the 1915-1916 “Movement of Extremists” reports of the Dublin Metropolitan Police Detective Department, which the Irish National Archives last year began making available online. He said he had not. This entry was posted in Irish America, Northern Ireland, Politics and tagged Caitriona Perry, Patrick Byrne on February 20, 2016 by admin.